A finely latticed and coffered ceiling. 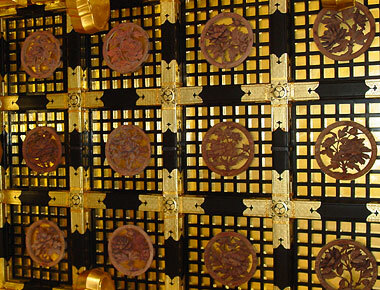 If each coffer has a mesh of small latticework that is the same as the larger ceiling, it is called, nijuukogumi goutenjou 二重小組格天井. This type of ceiling is found at Houryuuji *Yumedono 法隆寺夢殿 (739) and Shariden 舎利殿.